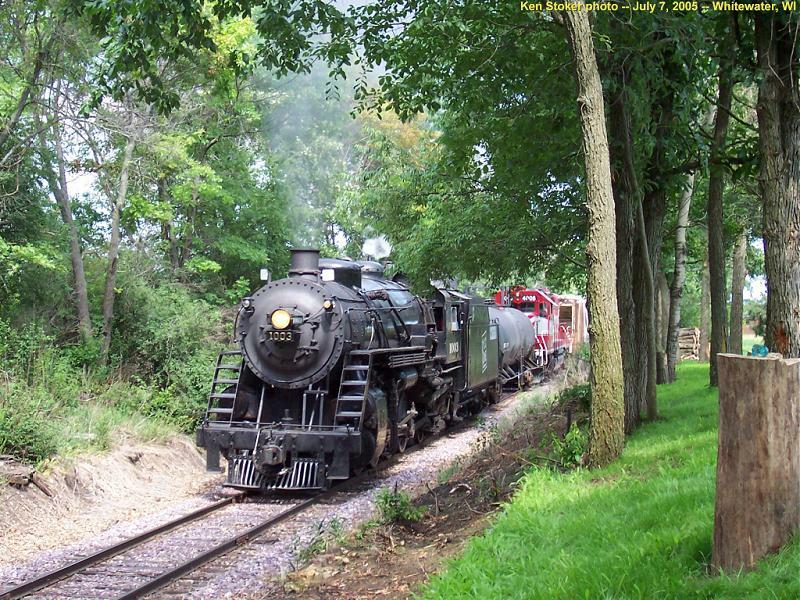 On July 7, 2005, Soo Line 2-8-2 Mikado steam engine traveled from its home at Wisconsin Automotive Museum^ in Hartford, WI, along the Wisconsin & Southern Railroad, to Janesville, Wisconsin. On July 9th, SOO #1003 was the steam-powered star of the Janesville Roundhouse centennial, and helped with the WSOR's 25th Anniversary celebration in Madison on July 23rd before heading back home on the 24th. Ken Stoker got photos of the steamer on its way down to Janesville and its way home, and his wife Brenda got pictures of the unit at the Roundhouse Centennial. Ken had sent me a few of his photos a while back, and I came across them recently while going through my e-mails. Inspired by the quality of those photos, I asked Ken about coming up with a whole album of 1003 pictures, hosted on Fuzzy World 3. Ken was definitely interested, and we spent most of January 2006 sending e-mails back and forth to each other as I put together mock-ups and he kept sending photos! The results of both our efforts can be seen in the album below.